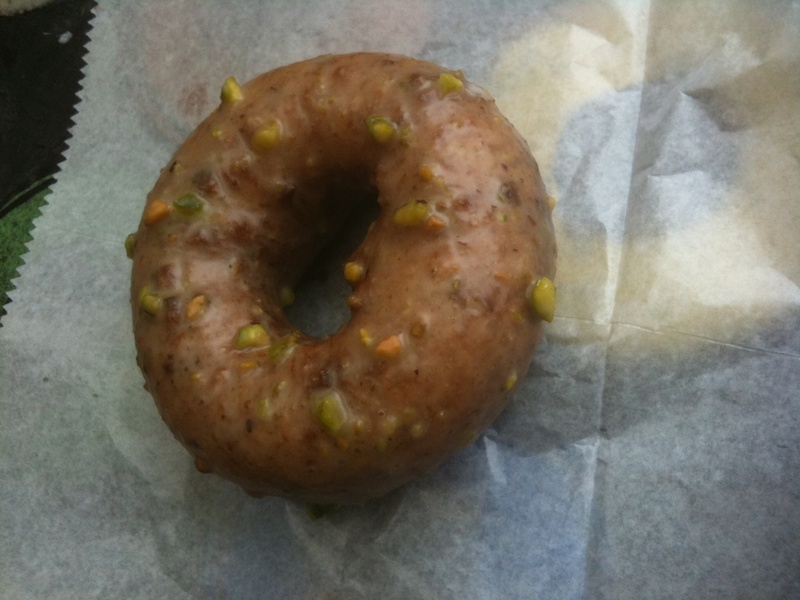 Pistachio cake doughnut from the Doughnut Plant in New York City. It seriously made me reconsider my stance against deep-frying things in my own kitchen. That’s funny; we’re kicking around the idea of a fryer right now too. You know, we both need it. Both of our doctors want us to get our weights up, and not move around so much. That doughnut looks good. I haven’t had a serious romance with one since Dunkin pulled out of Huntsville. Their blueberry cake had my number. I’ve always envisioned deep-frying as the most dangerous activity one can do in a kitchen, so I’ve avoided it. I’ve also never managed to move into a house with a kitchen vent that worked correctly, making frying even less attractive. We LOVE to visit Dunkin when we spot one out of town. I grew up with ready access to Krispy Kreme, so its charm is lost on me. I’m scareder of a pressure cooker.